The 81st 24 Hours of Le Mans (French: 81e 24 Heures du Mans) was an automobile endurance racing event held from 19 to 23 June 2013 at the Circuit de la Sarthe at Le Mans, France. It was the 81st running of the event, as organised by the Automobile Club de l'Ouest (ACO) since 1923. The race was the third and the premier round of the 2013 FIA World Endurance Championship, with 32 of the race's 56 entries contesting the championship. A test day was held two weeks prior to the race on 9 June. Approximately 245,000 spectators attended the event. The race was won by the No. 2 Audi R18 e-tron quattro driven by Dane Tom Kristensen, Brit Allan McNish and Frenchman Loïc Duval after it led the last 248 laps, taking the manufacturers' twelfth victory at Le Mans since its first victory in the 2000 edition. It was Kristensen's ninth victory, McNish's third and Duval's first. The car started from pole position but lost the lead at the start to the sister No. 1 Audi of André Lotterer, Marcel Fässler and Benoît Tréluyer who traded the position with the No. 8 Toyota TS030 Hybrid of Anthony Davidson, Stéphane Sarrazin and Sébastien Buemi under pit stop rotation until it was forced into the pit lane in the seventh hour to correct a crankshaft position sensor fault. Buemi, Davidson and Sarrazin finished second and Lucas di Grassi, Marc Gené and Oliver Jarvis in the No. 3 Audi completed the race podium. The Le Mans Prototype 2 (LMP2) category finished with the No. 35 OAK Racing Morgan car of Bertrand Baguette, Martin Plowman and Ricardo González ahead of the sister No. 24 entry of Alex Brundle, David Heinemeier Hansson and Alex Brundle by a distance of one lap. The class podium was completed by the No. 42 Greaves Motorsport Zytek Z11SN driven by Michael Krumm, Jann Mardenborough and Lucas Ordóñez. The No. 92 Porsche Manthey Racing 991 RSR of Romain Dumas, Marc Lieb and Richard Lietz won the Le Mans Grand Touring Professional (LMGTE Pro) class and the sister No. 91 vehicle of Jörg Bergmeister, Timo Bernhard and Patrick Pilet in second. Porsche also won the Le Mans Grand Touring Amateur (LMGTE Am) category with the No. 76 IMSA Performance Matmut car of Raymond Narac, Christophe Bourret and Jean-Karl Vernay, earning the marque its 100th class victory at Le Mans. The result of the race meant Kristensen, McNish and Duval advanced to the top of the Drivers' Championship with 94 points. The championship leaders going into the race Lotterer, Fässler and Tréluyer fell to second while Davidson, Sarrazin and Buemi maintained third due to the trio's second-place finish. Di Grassi, Gené and Jarvis moved from sixth to fourth and the duo of Alexander Wurz and Nicolas Lapierre rounded out the top five. With 102 points, Audi increased their lead over Toyota in the Manufacturers' Championship to 35 points with five rounds left in the season. The 2013 24 Hours of Le Mans was moved forward one week after a request was filed by the world governing body of motorsport, the Fédération Internationale de l'Automobile (FIA), in order to harmonise the 2013 motor racing calendar. It was the 81st annual edition of the event, as well as the third (and premier) of eight scheduled automobile endurance racing events of the 2013 FIA World Endurance Championship. Going into the race, Audi Sport Team Joest drivers André Lotterer, Marcel Fässler and Benoît Tréluyer led the Drivers' Championship with 44 points, one ahead of their teammates Allan McNish, Tom Kristensen and Loïc Duval in second. Anthony Davidson, Stéphane Sarrazin and Sébastien Buemi of Toyota were third with 27 points. Rebellion Racing's Neel Jani, Nico Prost and Nick Heidfeld placed fourth with 20 points, and Andrea Belicchi, Mathias Beche and Cheng Congfu in the other team car rounded out the top five with 16 points. In the Manufacturers' Championship, Audi (with 51 points) led their rivals Toyota with a 20-point advantage. The FIA Endurance Committee altered the balance of performance in three of the four categories to try and create parity in the classes. All hybrid and non-hybrid petrol powered LMP1 (Le Mans Prototype 1) cars received an additional 3 l (0.66 imp gal; 0.79 US gal) of fuel capacity for improved fuel mileage, allowing the Toyota TS030 Hybrid to run with a 76 l (17 imp gal; 20 US gal) fuel tank and the Rebellion Racing Lola B12/60s and the Strakka Racing HPD ARX-03c would have a fuel tank of 80 l (18 imp gal; 21 US gal) each. Porsche received an increase in performance by allowing a 0.3 mm (0.012 in) larger air restrictor on the air intake of their engines in the Le Mans Grand Touring Endurance Professional (LMGTE Pro) and Le Mans Grand Touring Endurance Amateur (LMGTE Am) classes. Aston Martin had 10 kg (22 lb) of ballast added to its LMGTE Pro Vantage while the Chevrolet Corvette C6.R received a 25 kg (55 lb) reduction in weight. The Ferrari 458 Italia and the SRT Viper GTS-R had no performance changes. The automotive group Automobile Club de l'Ouest (ACO) granted 56 invitations to the 24 Hours of Le Mans. Entries were divided between the LMP1, and LMP2 (Le Mans Prototype 2), LMGTE Pro and LMGTE Am categories. By the deadline for entries on 16 January, 71 applications had been filed with the ACO. Automatic entries are earned by teams which won their class in the previous running of the 24 Hours of Le Mans, or have won Le Mans-based series and events such as the American Le Mans Series, European Le Mans Series, and the Petit Le Mans. Some second-place finishers are also granted automatic entries in certain series. Entries are also granted for the winners of the Michelin Energy Endurance Challenge in the FIA World Endurance Championship. A final entry is granted to the champion in the Formula Le Mans category of the Le Mans Series, with the winner receiving their invitation in LMP2. For the first time, champions in the American Le Mans Series or at the Petit Le Mans did not automatically receive an entry. Instead, the American Le Mans Series was given three "at-large" entries, which the series awarded to teams interested in participating at Le Mans. As automatic entries were granted to teams, the teams were allowed to change their cars from the previous year to the next, but were not allowed to change their category. However, automatic invitations in the two GTE categories could be swapped between the two based on the driver line-ups chosen by these teams. On 14 November 2012, the list of automatic entries was announced by the ACO. JMB Racing and Conquest Racing were the two teams who chose not to accept their automatic invitations as they did not run in any series during the 2013 season. In conjunction with the announcement of entries for the FIA World Endurance Championship and the European Le Mans Series, the ACO announced the full 56 car entry list and ten vehicle reserve list during a press conference at the Eurosites George V in Paris on 1 February. In addition to the 32 guaranteed entries from the World Endurance Championship, ten entries came from the European Le Mans Series, and eight from the American Le Mans Series, while the rest of the field was filled with one-off entries competing only at Le Mans. The ACO continued the Garage 56 concept that was started in the 2012 race. Garage 56 allows a 56th entry to the race, using the rigors of the 24 Hours of Le Mans to test new technology. The ACO announced during 2012 that the Swiss-developed GreenGT vehicle had been granted the Garage 56 entry for the 2013 edition. The GreenGT LMP-H2 utilizes a hydrogen fuel cell to run electric motors within an open-top Le Mans Prototype style body. Three weeks before the race, GreenGT withdrew their entry, citing a lack of time to complete the complex fine-tuning of the hydrogen fuel cell system. No reserve was available for the 56th garage. Ten reserves were initially nominated by the ACO, limited to the LMP2 and both of the LMGTE categories. Extreme Speed Motorsports announced that their Ferrari 458 Italia would be withdrawn on 1 March, after it made a late switch to the P2 category in the American Le Mans Series. This promoted the No. 98 Aston Martin Racing Vantage to the race entry as a result and the car was moved from LMGTE Am to the LMGTE Pro class to bring the number of Aston Martins in the event to five. Two weeks later, Sébastien Loeb Racing withdrew its Oreca 03-Nissan because of financial troubles, promoting the No. 34 Race Performance Oreca-Judd entry from the reserves. Starworks Motorsport, defending champions of Le Mans and the FIA World Endurance Championship in the LMP2 category, withdrew their HPD-Honda entry on 9 April due to a lack of funding from sponsors, promoting Morand Racing's Morgan-Judd. Ten days later, Gulf Racing Middle East withdrew the second of its Lola-Nissan B12/80s and DKR Engineering's Lola-Judd replaced the entry. On 21 May, the ACO released a revised entry list that confirmed the withdrawal of Extreme Speed Motorsport's Ferrari 458 Italia, Sébastien Loeb Racing's Oreca 03-Nissan, Starworks Motorsports' HPD-Honda and Gulf Racing Middle East's Lola-Nissan B12/80 from the 24 Hours of Le Mans. On 1 June, GreenGT Technologies announced the withdrawal of the Garage 56 entry, with Prospeed Competition's LMGTE Am Porsche 911 GT3 RSR being announced as its replacement. By the start of the event, only a single reserve entry had not been promoted to the race. A test day was held on 9 June, two weeks prior to the race, and required all entrants for the race to participate in eight hours of track time divided into two sessions. All 56 entries were involved as well as a fourth Audi R18 e-tron quattro driven by Marco Bonanomi for 2014 tyre testing, a Signatech Alpine A450 for Paul-Loup Chatin and Tristan Gommendy and a spare Level 5 Motorsports HPD ARX-03b tested by Scott Tucker. Two Team Endurance Challenge-entered Le Mans Prototype Challenge Oreca-FLM09s also participated. Wet weather swept the area during the day and had Audi set the fastest time with a 3 minutes and 22.583 seconds lap from Duval in the No. 2 car at the end of the second session. Lucas di Grassi in the sister No. 3 entry followed in second and Lotterer completed an all-Audi top three lockout in third. Toyota placed fourth and sixth with its best times coming from Sarrazin and Alexander Wurz; they were separated by Bonanomi's Audi. During the first session, Duval was distracted by a unidentified object hitting his windscreen and heavily damaged the No. 2 car in the wall alongside the track at Tertre Rouge corner. Olivier Pla's OAK Racing Morgan-Nissan was the fastest LMP2 car with a late second session effort of 3 minutes and 38.801 and he was eight-tenths of a second faster than Nelson Panciatici's Signatech Alpine. LMGTE Pro was topped by Peter Dumbreck for Aston Martin Racing while Jamie Campbell-Walter also helped the marque lead in LMGTE Am. Crashes from Tracy Krohn of Krohn Racing at the outside of Mulsanne corner, AF Corse's Giancarlo Fisichella leaving the same turn and Dominik Kraihamer for Lotus in the Porsche Curves led to stoppages during both sessions. Two days after the test day, Audi and Signatech Alpine held two half an hour practice sessions in the morning and the afternoon on the shorter and permanent Bugatti Circuit in wet weather conditions to ensure car components were working efficiently before the race. Official practice was held on 19 June with the full 56-car field on track for four hours. A torrential rain shower fell at Le Mans in the early afternoon but it tapered off before practice commenced and the track dried up during the session although light rain returned midway through and some cars spun. Audi again led from the start with Tréluyer's No. 1 car setting a benchmark time until Duval went quickest with a 3 minutes and 25.514 seconds lap. Marino Franchitti's No. 33 Level 5 Motorsports car was the early LMP2 pace setter until Alex Brundle's No. 24 OAK Racing Morgan moved to first but it was Bertrand Baguette's sister No. 35 entry who was fastest with a lap of 3 minutes and 42.813 seconds. He was a second faster than Maxime Martin's No. 46 Thiriet by TDS Racing Oreca. An hour into the session, Eric Lux crashed the No. 41 Graves Motorsport car heavily into the barrier entering the second Mulsanne chicane and the session was stopped due to debris on the track. Lux was unhurt. The LMGTE Pro class lead constantly changed with Richard Lietz's No. 91 Porsche 911 RSR fastest with Kamui Kobayashi's No. 71 AF Corse Ferrari two-tenths of a second adrift in second. Kristian Poulsen's No. 95 Aston Martin was quickest in the LMGTE Am category. Krohn had a high speed accident at the downhill Dunlop Esses and his car was launched about 20 ft (6.1 m) into the air before landing in the gravel trap, bringing a premature end to practice due to the large amount of damage to the barriers. The first dry session of the week occurred on Wednesday night in the first of three qualifying sessions. Audi again led from the outset with Duval's early lap of 3 minutes and 23.169 seconds which he then improved to 3 minutes and 22.349 seconds. [n 1] The lap was not bettered for the remainder of the session, giving the No. 2 car provisional pole position. Marc Gené's sister No. 3 car followed in second and Lotterer's No. 1 vehicle was third. The two Toyotas replicated their test day results of fourth and sixth with drivers Kazuki Nakajima and Buemi although the former was second early in qualifying and a driveline problem curtailed the No. 8 Toyota's session at Arnage corner; they were separated by the leading LMP1 privateer, the No. 12 Rebellion. John Martin's No. 26 G-Drive Oreca set the only lap under 3 minute and 40 seconds in LMP2 with the best class lap of 3 minutes and 39.535 seconds, ahead of Franck Mailleux's No. 43 Morand Racing Morgan-Nissan and Brundle's No. 24 OAK Racing car. Pierre Thiriet had a heavy accident at the second Mulsanne chicane, denting the barriers alongside the track, and ending the session 15 minutes early because repairs could not be completed in time. The professional category of LMGTE was dominated by Aston Martin who took three of the first four places with the best time coming from Frédéric Makowiecki's No. 99 car as less than a second separated the top seven. Allan Simonsen helped Aston Martin to be fastest in LMGTE Am and he narrowly eclipsed Paolo Ruberti's No. 88 Proton Porsche. The No. 2 Audi R18 e-tron quattro earned pole position in the hands of Loïc Duval during the first qualifying session. Thursday's first qualifying session was affected by a waterlogged track after rain returned to the track with a short torrential downpour that fell minutes before the session commenced. Track conditions improved progressively as it dried up but every lap time was slower than on Wednesday evening. The best overall lap time of the session came from Davidson in the No. 7 Toyota with a time of 3 minutes and 42.507 seconds and the fastest Audi was the No. 3 entry of di Grassi in second. The second Audi driven by Fässler was third-fastest and the quickest privateer team was the No. 12 Rebellion in fourth. Davidson's No. 8 Toyota rounded out the top five. In LMP2, John Martin continued to keep the No. 26 G-Drive car on top in the category while Tom Kimber-Smith drove the No. 41 Greaves Motorsport Zytek-Nissan on its first laps since it was repaired and was second-fastest in its class during the session and was provisionally 19th overall. The sister No. 42 Greaves car was third in the hands of Jann Mardenborough. The No. 40 Boutsen Ginion Oreca-Nissan of Matt Downs crashed heavily into the inside barrier entering Indianapolis corner with its front. Downs was unhurt but qualifying ended early because repairs to the wall ran until after the session. The LMGTE Pro class was led by Jan Magnussen's No. 73 Chevrolet Corvette C6.R while the LMGTE Am category was topped by the No. 96 Aston Martin of Stuart Hall with his teammate Poulsen in second. With the stoppage in the second qualifying session, the third session was expanded by half an hour in order to give teams more time on the circuit. The track continued to be wet but it dried sufficiently enough to allow for improvement to lap times to be made with 20 minutes left as on-track grip continued to improve. Two stoppages curtailed running in the session: the first was triggered for ten minutes when Christophe Bourret removed the left-front wheel off the No. 77 IMSA Performance Matmut car in an impact with the wall at the first Mulsanne chicane. Jonny Kane in the No. 21 Strakka Racing HPD ARX-03c caused the second red flag after he heavily clouted the barrier and littered debris at the second Mulsanne chicane. Lotterer and his teammate di Grassi could not usurp Duval's time from Wednesday evening because they were caught out by damp patches on the circuit and the No. 2 started from pole position in the first Audi top three lockout on the Le Mans grid since the 2002 edition. Toyota could not challenge Audi but Sarrazin improved the No. 8 car's best lap in the final seconds of third qualifying to start fourth and Nakajima's sister No. 7 vehicle qualified fifth. The No. 12 Rebellion Lola of Jani was the highest-placed privateer in sixth overall. LMP2 continued to be led by G-Drive because of John Martin's lap from first qualifying until Pla's No. 24 OAK Racing Morgan pushed hard in clear air to clinch the pole position in the category with a time of 3 minutes and 38.621 seconds recorded at the end of the session. The car was a second faster than the No. 26 G-Drive Oreca which began from the second position. Oliver Turvey found improved pace in the No. 38 Jota Sport Zytek Nissan and bettered the car's best time to start third and thus making the top three in LMP2 to be represented by three manufacturers. Stefan Mücke got the No. 97 Aston Martin to provisional pole position in LMGTE Pro but his teammate Makowiecki in the sister No. 99 car responded immediately to retake the position with a lap of 3 minutes and 54.635 seconds. The No. 91 Porsche of Marc Lieb bettered the car's fastest lap time on the final lap of the third qualifying session to take third place on the starting grid. The lead in LMGTE Am remained with the No. 95 Aston Martin as Simonsen improved his own provisional pole lap to a 3 minutes and 57.776 seconds to go more than a second faster than Proton Competition's Porsche. Pole positions in each class are denoted in bold and by a . The fastest time set by each entry is denoted in gray. ^1 – The noted cars were moved to the back of the starting grid due to not having all three of their drivers setting qualifying lap times within 110% of the class leader's pole time. The cars took to the circuit on Saturday morning for a 45-minute warm-up session in dry and clear weather conditions. The No. 7 Toyota of Nicolas Lapierre set the team's fastest lap time of the weekend so far at 3 minutes and 26.227 seconds. McNish's No. 2 Audi was 0.504 seconds adrift in second and third was occupied by his teammate Fässler in the sister No. 1 car. The fastest LMP2 lap was set by John Martin's No. 26 G-Drive Oreca with a time of 3 minutes and 43.158 seconds, almost nine-tenths of a second faster than Brendon Hartley in the No. 48 Murphy Prototypes vehicle and Archie Hamilton's No. 25 Delta-ADR car was third. Porsche and AF Corse exchanged first in LMGTE Pro before Toni Vilander's No. 71 Ferrari set the best time in the category, while Patrick Long, driving the No. 77 Dempsey Proton Porsche, was fastest in LMGTE Am and second quickest amongst all LMGTE cars. Several drivers went off the track during the session which had three crashes. Kristensen hit the No. 67 IMSA Performance Matmut car of Pascal Gibon at Indianapolis turn and yellow flags were waved in the area because Kristensen was stranded in the grass to the inside of the circuit. Philippe Dumas crashed the No. 70 Larbre Compétition Corvette into the tyre barrier at the Dunlop chicane halfway through the session and the No. 25 G-Drive car of Tor Graves blew its right-rear tyre on the run to the Porsche Curves and veered heavily into the inside barriers and debris was littered on the track. Graves was unhurt. Allan Simonsen died from injuries he sustained during the ninth minute of the 24 Hours of Le Mans. Approximately 245,000 spectators attended the event on race day. Weather conditions at the start were damp and overcast. The air temperature throughout ranged from 12.8 to 18.3 °C (55.0 to 64.9 °F) and the track temperature was between 15.5 to 21.8 °C (59.9 to 71.2 °F). The race began at 15:00 Central European Summer Time (UTC+02:00), with Grand-Am Road Racing founder and NASCAR vice-chairman Jim France waving the French tricolour to signal the start the race. Lotterer moved past McNish for the lead and then Lapierre overtook McNish for second at the second Mulsanne chicane but he lost the position at the exit of the corner. Lapierre then reclaimed second from McNish on the approach to Mulsanne turn. Davidson overtook di Grassi for second through the Ford chicane as Darren Turner's No. 97 Aston Martin took the lead of LMGTE Pro from his Aston Martin teammate Bell in the No. 95 car. Lapierre was closing on Lotterer when the safety cars were deployed for an accident at Tetre Rouge corner. LMGTE Am leader Simonsen had pulled clear of the class field when nine minutes into the race the rear-left corner of his car lost traction on a kerb leaving Tetre Rouge corner. When he attempted to correct, his car veered left and he collided heavily with the outside armco barrier at a near head-on trajectory. The impact crushed the roof of the car and its supporting roll cage; its force launched it slowly back onto the circuit with a wheel and its doors detached. Medical personnel were swift to tend to Simonsen who was reported to be conscious and talking to officials before going into unconsciousness. He was extricated from the car and transported to the infield medical centre after about 20 minutes. Simonsen was later declared dead from his injuries at the infield medical centre. [n 2] His partner Catrina requested Aston Martin Racing to continue racing in the event. The safety cars remained on track for 58 minutes in which the LMGTE Pro order was divided into two halves. When racing resumed, Lapierre dropped to fifth when he was overtaken by Davidson and the Audi duo of McNish of di Grassi within half a lap. Davidson took the overall lead for the first time on pit stop cycle rotation due to Toyota's better fuel economy over the Audis and kept it until the end of lap fifteen. Lieb moved to the front of LMGTE Pro by passing the Aston Martins of Rob Bell and Turner but the No. 91 Porsche lost the first position to Turner halfway through the second hour. At the start of the third hour, Lotterer was demoted to second when Lapierre moved past him on the exit to Mulsanne corner but he was not recorded as the leader because he entered the pit lane at the end of lap twenty-seven. Rain returned to the track at this time as Turvey and Maxime Martin moved in front of Pierre Kaffer's No. 49 Pecom Racing Oreca for second and third in LMP2. Lapierre stopped at the side of the Mulsanne Straight with a fuel pressure fault for half a minute before resuming in fifth. At the close of hour three, Gibon's No. 67 IMSA Performance Matmut car blew its left-rear tyre and lost the lead of LMGTE Am. The rain later eased and Audi re-established its advantage in the first three overall while Brundle extended the No. 24 OAK Racing car's gap in LMP2 over Mike Conway after he went into the gravel trap at Mulsanne corner while lapping Hall's No. 99 Aston Martin and Matt Griffin assumed the lead in LMGTE Am. The main on-track action involved Lucas Luhr who ran wide in the Porsche Curves and glanced the inside barrier alongside the track but he continued without significant damage to the No. 38 Jota Sport Zytek. Makowiecki moved past his Aston Martin teammate Mücke for the LMGTE Pro lead and Oliver Jarvis was delayed by the No. 39 DKR Engineering Lola through the Porsche Curves and lost third to Buemi. He retook the position from Buemi on the next lap. Later, Bill Auberlen relieved Mücke in the No. 97 Aston Martin and he was overtaken by Patrick Pilet's No. 92 Porsche for second in LMGTE Pro. Seven minutes into the sixth hour, the left-rear tyre of Gommendy's No. 36 Signatech Alpine blew and disintegrated entering the Mulsanne Straight as he hit the barrier at Tetre Rouge turn. The safety cars were dispatched for 15 minutes for debris removal. As the safety cars were recalled, David Heinemeier Hansson in the No. 24 OAK Racing Nissan collided with Duval's leading No. 2 Audi in the Porsche Curves, losing him the LMP2 lead to the No. 26 G-Drive car of Roman Rusinov. The safety cars were once again required for a short period of time as Kraihamer's No. 32 Lotus T128 shed its rear bodywork on the Mulsanne Straight and this nullified Tréluyer and Jarvis' advantage because Duval returned to second after he made a pit stop during the period. When racing resumed, Duval reset the fastest lap of the race to 3 minutes and 23.269 seconds as Bruno Senna's No. 99 Aston Martin traded the lead of LMGTE Pro with Dumbreck's No. 97 car for two laps. Two of three contenders for the outright victory ran into trouble soon after. Jarvis' No. 3 Audi made contact with slower traffic and his right-rear tyre was punctured and spun under the Dunlop Bridge. The tyre carcass fell off as he returned to the pit lane but repairs to the rear of the car were deemed unnecessary by his crew and the car returned to the circuit in fourth overall. Later, the No. 1 Audi of Tréluyer was forced into the garage for 43 minutes to replace a failed crankshaft position sensor and gave the lead back to the sister No. 2 Audi of Duval and Sarrazin's No. 8 Toyota took over second. Darryl O'Young had been the fastest driver in LMGTE Am at the time and brought the No. 55 AF Corse Ferrari into the class lead. The LMP2 class-winning No. 24 OAK Racing Morgan of Bertrand Baguette, Martin Plowman and Ricardo González. John Martin's No. 26 G-Drive entry ceded the lead of LMP2 to Baguette's No. 35 OAK Racing car when he was instructed to enter the pit lane to have an illuminated door number panel repaired which took two laps to complete. The safety cars were deployed for a fourth time after 8 hours and 50 minutes when Graves spun his No. 25 Delta-ADR vehicle into the barriers at the Porsche Curves and scattered debris on the track. In the outright lead, the safety cars had divided the field into two with Kristensen increasing his lead to three minutes and seven seconds over Sarrazin. Safety cars were required once again at the close of the ninth hour when Krohn spun and crashed his Ferrari in the Porsche Curves and retired. Racing resumed ten minutes into hour ten with Gianluca Roda beaching the No. 88 Porsche into the gravel trap at the Dunlop Bridge and allowing actor Patrick Dempsey in the No. 77 Dempsey Proton car into the lead of LMGTE Am. Turner ran the No. 97 Aston Martin into the gravel at Mulsanne corner, allowing Lieb's No. 91 Porsche to pass him for second in LMGTE Pro. In LMGTE Am, Lorenzo Case's No. 55 AF Corse Ferrari returned to the category lead when Dempsey made a scheduled pit stop for fuel. For 21 minutes, safety cars were needed as Tony Burgess destroyed the rear of the No. 30 HVM Status Lola in the Porsche Curves. Burgess was unhurt and he was transported to hospital for a precautionary check-up. As the race approached its halfway point, Howard Blank significantly damaged the No. 54 AF Corse Ferrari as well as the catchfencing at the Dunlop Esses and Tetre Rouge corner, causing an event record seventh safety car period. Blank was unhurt and tried to return to the pit lane but he could not do so and retired. During the safety car period, the No. 99 Aston Martin had its brake discs changed and gave the LMGTE Pro lead to the No. 92 Porsche. The safety cars were due to be withdrawn just before the conclusion of hour 13 but heavy rain over much of the circuit extended it by nine minutes and several teams installed wet-weather tyres on their cars. Two laps after racing resumed, Lapierre's No. 7 Toyota got ahead of his teammate Buemi for second overall and he maintained until Buemi retook the position. Before the close of the 14th hour, Kane spun and beached the No. 21 Strakka car in the gravel trap at the Ford Chicane but got the car back onto the circuit. Romain Brandela's No. 39 DKR Engineering Lola piled into the No. 55 AF Corse Ferrari and the No. 88 Proton Porsche before swerving in the front of Buemi's No. 8 Toyota at the Dunlop chicane. Luhr's No. 38 Jota Sport Zytek bowed out of a battle with the No. 42 Greaves Zytek of Michael Krumm for third in LMP2 when he entered the garage for repairs to his front wheel bearing. In the 16th hour, Richard Lietz brought the No. 92 Porsche to the pit lane and had its brake discs changed in four minutes, giving the lead of LMGTE Pro to Senna's No. 99 Aston Martin, which held a three-quarters of a minute advantage over him but Lietz lowered it by six seconds by the hour's end. Light rain returned during the 17th hour but it was not heavy enough to affect the race. In LMGTE Am, Bourret led in the No. 76 IMSA Performance Matmut Porsche by a lap over Lorenzo Case's No. 55 AF Corse Ferrari while Dempsey in his No. 77 Porsche was being closed on by Marco Cioci's No. 61 car. The 18th hour commenced with Auberlen's No. 98 Aston Martin emitting smoke from the car and leaking a large amount of oil down the Mulsanne Straight before stopping at Mulsanne corner. The safety cars were dispatched for 25 minutes to allow the oil to be dried by track marshals. Racing resumed for only half a minute as the safety cars were needed to tend to repairs to a heavily damaged trackside barrier exiting the second Mulsanne chicane after Belicchi was about to lap a slower GTE Porsche but lost traction at the rear of the No. 13 Rebellion and veered right into the barrier. He returned to the pit lane for extensive repairs to the car's front. When racing resumed, Lietz retook the LMGTE Pro lead. He held it until his spin at the Dunlop chicane delayed Dumbreck, allowing Senna in the class lead and Timo Bernhard's No. 91 Porsche into second. The No. 92 Porsche 991 of Marc Lieb, Richard Lietz and Romain Dumas won the LMGTE Pro class. After the safety cars were withdrawn, Makowiecki relieved Senna in the No. 99 Aston Martin and pulled away from Lieb's No. 92 Porsche. Rain again fell on the circuit with five hours and fifteen minutes to go and some cars were caught in the change of conditions. Makowiecki veered to the left coming out of the second Mulsanne chicane and collided with the barrier head-on. That ricocheted the car back to the centre of the track. Makowiecki was unhurt but the safety cars were again required as repairs were made to the barrier and Lieb became the new LMGTE Pro leader. After racing continued, Nakajima's No. 7 Toyota cut the Dunlop chicane and launched over the kerb and spun backwards across the circuit. He rejoined without losing third. The rain eased and track conditions improved as Turner reduced Lieb's advantage at the front of LMGTE Pro to 8.8 seconds by the end of the 20th hour. In the 21st hour, a miscommunication with the mechanics of Matteo Malucelli's No. 51 AF Corse Ferrari in his pit box released him with the fuelling hose attached to the car and into a collision with the No. 45 OAK Racing Morgan of Philippe Mondolot. Rain returned to the circuit during the hour and the No. 1 Audi of Lotterer aquaplaned into a gravel trap and narrowly avoided piling into Davidson's No. 8 Toyota on the Mulsanne Straight. The No. 3 Audi of Jarvis moved past Lapierre's No. 7 Toyota for third during pit stop rotation and Lapierre went off at the exit of Indianapolis corner as he battled to retake the position. Kristensen's No. 2 Audi made a pit stop for a slow puncture as heavy rain returned with 90 minutes left and several cars aquaplaned on the saturated circuit. Lapierre's No. 7 Toyota had no grip on the run into the Porsche Curves and veered deep left into the tyre wall at high speed. He exited the car but returned to it after losing two minutes. Baguette had an anxious moment going into Indianapolis turn in the No. 24 OAK Racing car but kept the LMP2 lead over his teammate Pla in the sister No. 25 car. The safety cars were again dispatched as the LMGTE Pro lead returned to Lieb's No. 91 Porsche from Mücke's No. 97 Aston Martin in pit stop rotation. During the safety car period, Pla's No. 25 OAK Racing entry was separated from his teammate Baguette and was four minutes behind as the No. 6 Toyota was repaired in its garage and returned in fourth. Just before the safety cars entered the pit lane with half an hour to go, the No. 97 Aston Martin made a pit stop for tyres and made the LMGTE Pro battle against the two lead Porsches. More rain began to fall 15 minutes later and it turned into a deluge over the entire circuit as Kristensen's No. 2 Audi began the final lap. The No. 26 G-Drive Racing Oreca 03 was disqualified from third in LMP2 because of an oversized fuel tank. The No. 2 Audi of Kristensen, Duval and McNish led the final 248 laps to claim the manufacturer's twelfth victory at Le Mans since its first at the 2000 race. It was Kristensen's ninth overall victory since his first, McNish's third and Duval's first. Buemi unlapped himself from Kristensen in the final half an hour but fell back a lap soon after. He, Davidson and Sarrazin's No. 8 Toyota finished second and the No. 3 Audi of di Grassi, Jarvis and Gené completed the overall podium in third. On the podium, the Danish flag was flown at half-mast in memory of Simonsen and Kristensen dedicated the victory to him. The No. 21 Strakka HPD ARX-03c of Kane, Danny Watts and Nick Leventis was unhindered after the demise of Rebellion and won the privateer LMP1 category in sixth overall. OAK Racing won the LMP2 class with the No. 35 Morgan of Baugette, Ricardo González and Martin Plowman and the team's second car of Pla, Heinememer Hansson and Brundle was a lap behind for a second-place finish. John Martin, Conway and Rusinov finished third in class in the No. 26 G-Drive Oreca but the car was disqualified because its fuel tank was found to be over the mandated limit of 75 l (16 imp gal; 20 US gal), promoting the No. 42 Greaves Zytek of Mardenborough, Krumm and Lucas Ordóñez to the category podium. In LMGTE Pro, Porsche Manthey Racing claimed the category win on the Le Mans debut of the new 991-generation race car with drivers Lieb, Lietz and Romain Dumas in the No. 92 car, while the LMGTE Am class increased Porsche's total class victories at Le Mans to 100 with the No. 76 IMSA Performance entry of Jean-Karl Vernay, Raymond Narac and Bourret winning. Simonsen was mourned by the motorsport community. A memorial foundation was established in his honour by the Danish Automobile Sports Union and he was given a funeral in his hometown of Odense in Southern Denmark on 2 July. Following Simonsen's death, the ACO announced the improvements to several sections of the circuit in December 2013. Tertre Rouge was re-profiled and new barriers and tire walls were added at the corner's exit onto the Mulsanne Straight. Run-off areas in the Corvette corners were expanded, and TecPro barriers were added behind the tire walls at the start of the Porsche corners. Large kerbs were added to the paved run-off at the second Ford chicane to deter cars from cutting the corner. A new safety system was implemented, which allowed for the intervention of safety vehicles on a particular section of the circuit without the need for neutralising the entire race with safety cars. The system, termed a slow zone, requires cars to slow and maintain a speed of 60 km/h (37 mph) within a specific zone. With their victory, Kristensen, McNish and Duval became the new leaders of the Drivers' Championship with 94 points. Lotterer, Fässler and Tréluyer fell to second and were thirty points behind their teammates. Davidson, Sarrazin and Buemi's second-place result enabled the trio to remain in third while di Grassi, Gené and Jarvis' third-position result allowed them to advance from sixth to fourth. Wurz and Lapierre rounded out the top five drivers in the championship standings. In the Manufacturers' Championship, Audi kept their lead with 102 points but increased it to thirty-five points over Toyota with five rounds left in the season. Class winners are marked in bold and by a . Cars failing to complete 70% (244 laps) of winner's distance are marked as Not Classified (NC). ^ Loïc Duval's time was one and a half second faster than the 2012 pole position lap. ^ Allan Simonsen was the first driver to die at the 24 Hours of Le Mans since Sébastien Enjolras during pre-qualifying for the 1997 race and the first during the race itself since Jo Gartner in the 1986 edition. ^ The No. 26 G-Drive Racing Oreca 03 was disqualifed as its fuel tanks was found to exceed the maximum limit of 75 l (16 imp gal; 20 US gal). ^ Beer, Matt (30 August 2012). "Next year's Le Mans 24 Hours is moved back a week after FIA request". Autosport. Archived from the original on 4 November 2018. Retrieved 4 November 2018. ^ a b c Laban, Brian (19 June 2013). "Le Mans 2013: what to expect". The Daily Telegraph. Archived from the original on 2 January 2014. Retrieved 4 November 2018. ^ Carter, Jeff (28 September 2012). "FIA WEC Unveils 2013 Provisional Calendar". FIA World Endurance Championship. Archived from the original on 1 December 2017. Retrieved 4 November 2018. ^ a b c d e f "WEC Classification". FIA World Endurance Championship. Archived from the original on 28 January 2014. Retrieved 4 November 2018. ^ Dagys, John (27 May 2013). "LE MANS: BoP Adjustments For LMP1 Announced". Speed. Archived from the original on 9 June 2013. Retrieved 7 November 2018. ^ Dagys, John (22 May 2013). "LE MANS: BoP Adjustments For GTE Announced". Speed. Archived from the original on 14 June 2013. Retrieved 7 November 2018. ^ "71 Entries Posted For 2013 Le Mans 24 Hours". DailySportsCar. 25 January 2013. Archived from the original on 2 October 2014. Retrieved 4 November 2018. ^ a b c Mercier, Laurent (14 November 2012). "Treize équipes sélectionnées aux 24 Heures du Mans 2013 !" (in French). Endurance-Info. Archived from the original on 5 December 2013. Retrieved 4 November 2018. ^ Dagys, John (10 September 2012). "ALMS: Rebellion Targets Petit Le Mans Win". Speed. Archived from the original on 12 September 2016. Retrieved 4 November 2018. ^ a b Wittemeier, Roman (1 February 2013). "Le Mans 2013: Das sind die Starter" (in German). Motorsport-Total. Archived from the original on 4 November 2018. Retrieved 4 November 2018. ^ a b Doret, Jean-Philippe (5 June 2012). "GreenGT LMP H2 invited as experimental prototype by the ACO to race at the 24 Hours of Le Mans in 2013" (in French). Automobile Club de l'Ouest. Archived from the original on 8 June 2012. Retrieved 18 June 2012. ^ "Hydrogen-electric powered GreenGT H2 pulls out of 24 Hours of Le Mans". Autoweek. 1 June 2013. Archived from the original on 18 January 2017. Retrieved 4 November 2018. ^ Dagys, John (1 March 2013). "LE MANS: ESM Withdraws From LM24". Speed. Archived from the original on 4 March 2013. Retrieved 4 November 2018. ^ "Sebastien Loeb Racing Pulls Le Mans 24 Hours Entry". DailySportsCar. 15 March 2013. Archived from the original on 11 October 2014. Retrieved 4 November 2018. ^ Watkins, Gary (3 June 2013). "Starworks calls time on 2013 World Endurance Championship bid". Autosport. Archived from the original on 3 June 2013. Retrieved 4 November 2018. ^ "24 Heures du Mans 2013 : Une Lola Gulf Racing Middle East forfait, DKR Engineering repêché". Ouest-France (in French). 19 April 2013. Archived from the original on 4 November 2018. Retrieved 4 November 2018. ^ "Provisional Le Mans Entry Released". DailySportsCar. 21 May 2013. Archived from the original on 4 November 2018. Retrieved 4 November 2018. ^ Dagys, John (1 June 2013). "LE MANS: GreenGT Withdraws From LM24". Speed. Archived from the original on 15 June 2013. Retrieved 1 June 2013. ^ "List of the Competitors and Cars Invited to the Administrative Checkings and Scrutineering - Sunday 16th and Monday 17th June 2013" (PDF). Automobile Club de l'Ouest. 1 June 2013. Archived from the original (PDF) on 12 June 2013. Retrieved 4 November 2018. ^ a b c "24 Heures du Mans 2014 Supplementary Regulations" (PDF). Automobile Club de l'Ouest. 12 December 2012. Archived from the original (PDF) on 3 December 2013. Retrieved 7 February 2013. ^ a b c Goodwin, Graham (10 June 2013). "Le Mans Test Day: Wrapping Up That One". DailySportsCar. Archived from the original on 20 August 2016. Retrieved 4 November 2018. ^ a b c d Watkins, Gary (9 June 2013). "Le Mans 24 Hours: Duval puts Audi on top on test day". Autosport. Archived from the original on 4 November 2018. Retrieved 4 November 2018. ^ Roger, Jean-René (11 June 2013). "2013 Le Mans 24 Hours Practice continues!". Automobile Club de l'Ouest. Archived from the original on 5 November 2018. Retrieved 5 November 2018. ^ a b c d e Potts, Marcus (19 June 2013). "Le Mans 24 Hours: Free Practice Report". DailySportsCar. Archived from the original on 5 November 2018. Retrieved 5 November 2018. ^ a b c d O'Leary, Jamie (19 June 2013). "Le Mans 24 Hours: Duval leads Audi practice lockout". Autosport. Archived from the original on 4 December 2013. Retrieved 5 November 2018. ^ Mercier, Laurent (22 June 2013). "Drapeau rouge au Mans: Sortie de la Caterham" (in French). Endurance-Info. Archived from the original on 22 June 2013. Retrieved 5 November 2018. ^ a b c Potts, Marcus (19 June 2013). "Le Mans 24 Hours: First Qualifying Session Report". DailySportsCar. Archived from the original on 20 August 2016. Retrieved 5 November 2018. ^ Rolland, Emmanuel (21 June 2013). "Le Mans 24 Hours: Audi No. 2 retains pole position". Auto123. Archived from the original on 22 June 2013. Retrieved 5 November 2018. ^ a b c d e Tremayne, Sam (19 June 2013). "Le Mans 24 Hours: Loic Duval puts Audi on provisional pole". Autosport. Archived from the original on 5 December 2013. Retrieved 5 November 2018. ^ a b c Dagys, John (19 June 2013). "LE MANS: Audi Leads Wednesday LM24 Qualifying". Speed. Archived from the original on 23 June 2013. Retrieved 5 November 2018. ^ a b Kilbey, Stephen (20 June 2013). "Le Mans 24 Hours: Second Qualifying Session Report". DailySportsCar. Archived from the original on 21 August 2016. Retrieved 5 November 2018. ^ a b c d e O'Leary, Jamie (20 June 2013). "Le Mans 24 Hours: Audi on provisional pole, Toyota fastest in the wet". Autosport. Archived from the original on 5 December 2013. Retrieved 5 November 2018. ^ Dagys, John (20 June 2013). "LE MANS: Audi Retains Pole For LM24". Speed. p. 2. Archived from the original on 24 June 2013. Retrieved 5 November 2018. ^ a b c d e Tremayne, Sam (20 June 2013). "Le Mans 24 Hours: Loic Duval on pole, Audi locks out top three". Autosport. Archived from the original on 3 December 2013. Retrieved 5 November 2018. ^ a b c d Potts, Marcus (20 June 2013). "Le Mans 24 Hours: Third Qualifying Session Report". DailySportsCar. Archived from the original on 5 November 2018. Retrieved 5 November 2018. ^ a b Dagys, John (20 June 2013). "LE MANS: Audi Retains Pole For LM24". Speed. p. 1. Archived from the original on 26 June 2013. Retrieved 5 November 2018. ^ "Qualifying Practice 1 – Final Classification" (PDF). Automobile Club de l'Ouest. 20 June 2013. Archived from the original (PDF) on 11 November 2013. Retrieved 20 June 2013. ^ "Qualifying Practice 2 – Provisional Classification" (PDF). Automobile Club de l'Ouest. 20 June 2013. Archived from the original (PDF) on 11 November 2013. Retrieved 20 June 2013. ^ "Qualifying Practice 3 – Provisional Classification" (PDF). Automobile Club de l'Ouest. 20 June 2013. Archived (PDF) from the original on 11 November 2013. Retrieved 20 June 2013. ^ "Race – Final Starting Grid" (PDF). Automobile Club de l'Ouest. 22 June 2013. Archived (PDF) from the original on 26 June 2013. Retrieved 22 June 2013. ^ Dagys, John (22 June 2013). "LE MANS: LM24 Notebook". Speed. Archived from the original on 26 June 2013. Retrieved 22 June 2013. ^ a b c Kilbey, Stephen (22 June 2013). "Le Mans 24 Hours: Race Morning Warm Up Report". DailySportsCar. Archived from the original on 5 November 2018. Retrieved 5 November 2018. ^ a b c O'Leary, Jamie (22 June 2013). "Le Mans 24 Hours: Lapierre puts Toyota on top in warm-up". Autosport. Archived from the original on 5 December 2013. Retrieved 5 November 2018. ^ a b c d Richards, Giles (23 June 2013). "Audi's 12th Le Mans win in 13 years clouded by death of Allan Simonsen". The Guardian. Archived from the original on 26 October 2013. Retrieved 6 November 2018. ^ "81º Edition des 24 Heures du Mans – FIA WEC – Race – Weather Report" (PDF). Automobile Club de l'Ouest. 23 June 2013. Retrieved 6 November 2018. ^ Wilkins, Robert (23 May 2013). "Grand-Am founder Jim France to wave starting flag at Le Mans". Crash. Archived from the original on 6 November 2018. Retrieved 6 November 2018. ^ a b c d Potts, Marcus (22 June 2013). "Le Mans 24 Hours: Hour 1 Summary". DailySportsCar. Archived from the original on 20 August 2016. Retrieved 6 November 2018. ^ a b Norman, James (2 July 2013). "The Medical Causes of Racing Deaths and Resulting Race Car Improvements". Complex. Archived from the original on 14 February 2015. Retrieved 5 November 2018. ^ Bromberg, Nick (22 June 2013). "Allan Simonsen dies from injuries suffered during crash at 24 Hours of Le Mans". Yahoo! Sports. Archived from the original on 6 November 2018. Retrieved 6 November 2018. ^ Ann Kirk, Connie (18 December 2017). Taken by Speed: Fallen Heroes of Motor Sport and Their Legacies. Rowman & Littlefield. p. 27. ISBN 978-1-4422-7762-5. ^ Green, David (24 June 2013). "Driver Death at Le Mans Raises Safety Issue Again". Edmunds. Archived from the original on 28 June 2013. Retrieved 5 November 2018. ^ a b c Baldwin, Alan; Collings, Tim (22 June 2013). "Danish driver Simonsen dies at Le Mans". Reuters. Archived from the original on 1 October 2017. Retrieved 5 November 2018. ^ a b c Latieule, Trung (22 June 2013). "Driver dies in 24 Hours of Le Mans race". The Seattle Times. Associated Press. Archived from the original on 6 November 2018. Retrieved 6 November 2018. ^ Potts, Marcus (22 June 2013). "Le Mans 24 Hours: Hour 2 Summary". DailySportsCar. Archived from the original on 6 November 2018. Retrieved 6 November 2018. ^ a b Potts, Marcus (22 June 2013). "Le Mans 24 Hours: Hour 3 Summary". DailySportsCar. Archived from the original on 20 August 2016. Retrieved 6 November 2018. ^ O'Leary, Jamie (22 June 2013). "LM24 Hour 3: Andre Lotterer maintains Audi's lead". Autosport. Archived from the original on 1 March 2014. Retrieved 6 November 2018. ^ O'Leary, Jamie (22 June 2013). "LM24 H4: Audi continues to keep Toyota out of top three". Autosport. Archived from the original on 20 December 2014. Retrieved 6 November 2018. ^ Potts, Marcus (22 June 2013). "Le Mans 24 Hours: Hour 4 Summary". DailySportsCar. Archived from the original on 20 August 2016. Retrieved 6 November 2018. ^ Potts, Marcus (22 June 2013). "Le Mans 24 Hours: Hour 5 Summary". DailySportsCar. Archived from the original on 20 August 2016. Retrieved 6 November 2018. ^ a b Tremayne, Sam (20 December 2014). "LM24 Hour 6: Treluyer and Duval continue tense battle". Autosport. Archived from the original on 20 December 2014. Retrieved 6 November 2018. ^ a b ten Caat, Marcel (22 June 2013). "Le Mans 24 Hours: Hour 6 Summary". DailySportsCar. Archived from the original on 20 August 2016. Retrieved 6 November 2018. ^ a b Tremayne, Sam (22 June 2013). "LM24 H7: Benoit Treluyer's leading Audi hits trouble, Duval leads". Autosport. Archived from the original on 20 December 2014. Retrieved 6 November 2018. ^ Hobbs, David (22 June 2013). "Le Mans: Audi Leads After Nine Hours But Race Marred By Death Of Allan Simonsen (VIDEO, PICTURES)". HuffPost. Archived from the original on 27 June 2013. Retrieved 6 November 2018. ^ Kilbey, Stephen (22 June 2013). "Le Mans 24 Hours: Hour 8 Summary". DailySportsCar. Archived from the original on 20 August 2016. Retrieved 6 November 2018. ^ O'Leary, Jamie (22 June 2013). "LM24 H8: Kristensen leads under caution as night descends". Autosport. Archived from the original on 20 December 2014. Retrieved 6 November 2018. ^ O'Leary, Jamie (22 June 2013). "LM24 H9: Audi's Kristensen on verge of putting Toyotas one lap down". Autosport. Archived from the original on 20 December 2014. Retrieved 6 November 2018. ^ "Le Mans 24 Hours: Hour 10 Summary". DailySportsCar. 22 June 2013. Archived from the original on 20 August 2016. Retrieved 6 November 2018. ^ "Le Mans 24 Hours: Hour 12 Summary". DailySportsCar. Archived from the original on 28 August 2016. Retrieved 6 November 2018. ^ Tremayne, Sam (23 June 2013). "LM24 H12: Allan McNish keeps Audi in control at half distance". Autosport. Archived from the original on 20 December 2014. Retrieved 6 November 2018. ^ Tremayne, Sam (23 June 2013). "LM24 H13: Toyota closes back in on Audi under cautions". Autosport. Archived from the original on 20 December 2014. Retrieved 6 November 2018. ^ a b Howson, Mark; Kilbey, Stephen (23 June 2013). "Le Mans 24 Hours: Hours 13 & 14 Summary". DailySportsCar. Archived from the original on 28 August 2016. Retrieved 6 November 2018. ^ Mitchell, Scott (23 June 2013). "LM24 H15: Toyotas slip back as Duval strengthens lead". Autosport. Archived from the original on 20 December 2014. Retrieved 6 November 2018. ^ Mitchell, Scott (23 June 2013). "LM24 H16: Loic Duval opens up one-lap advantage for Audi". Autosport. Archived from the original on 20 December 2014. Retrieved 6 November 2018. ^ "Le Mans 24 Hours: Hour 17 Summary". DailySportsCar. 23 June 2013. Archived from the original on 28 August 2016. Retrieved 6 November 2018. ^ Llewellyn, Craig (23 June 2013). "Hour 18: Safety car returns, Rebellion quashed". Crash. Archived from the original on 6 November 2018. Retrieved 6 November 2018. ^ Howson, Mark; Kilbey, Stephen; Potts, Marcus (23 June 2013). "Le Mans 24 Hours: Hour 18 Summary". DailySportsCar. Archived from the original on 28 August 2016. Retrieved 6 November 2018. ^ O'Leary, Jamie (23 June 2013). "LM24 H18: Audi still ahead amid safety-car running". Autosport. Archived from the original on 20 December 2014. Retrieved 6 November 2018. ^ "Le Mans 24 Hours: Hour 19 Summary". DailySportsCar. 23 June 2013. Archived from the original on 28 August 2016. Retrieved 6 November 2018. ^ Llewellyn, Craig (23 June 2013). "Hour 19: #99 crashes out of GTE-Pro lead". Crash. Archived from the original on 6 November 2018. Retrieved 6 November 2018. ^ Howson, Mark (22 June 2013). "Le Mans 24 Hours: Hour 20 Summary". DailySportsCar. Archived from the original on 28 August 2016. Retrieved 6 November 2018. ^ Tremayne, Sam (23 June 2013). "LM24: H21: Audi and Duval three hours from victory". Autosport. Archived from the original on 20 December 2014. Retrieved 6 November 2018. ^ a b Kilbey, Stephen (23 June 2013). "Le Mans 24 Hours: Hours 21 & 22 Summary". DailySportsCar. Archived from the original on 28 August 2016. Retrieved 6 November 2018. ^ a b O'Leary, Jamie (23 June 2013). "Le Mans 24 Hours Hour 23: Audi still ahead amid rain chaos". Autosport. Archived from the original on 20 December 2014. Retrieved 7 November 2018. ^ Lewin, Andrew (23 June 2013). "Hour 23: Drama as downpour hits LMP1, LMP2 and GTE-Pro battles". Crash. Archived from the original on 6 November 2018. Retrieved 7 November 2018. ^ Howson, Mark; Kilbey, Stephen (23 June 2013). "Le Mans 24 Hours: Hours 23 & 24 Summary". DailySportsCar. Archived from the original on 28 August 2016. Retrieved 7 November 2018. ^ "81º Edition des 24 Heures du Mans – Race – Leader Sequence" (PDF). Automobile Club de l'Ouest. 23 June 2013. p. 1. Retrieved 7 November 2018. ^ a b c O'Leary, Jamie (23 June 2013). "Le Mans 24 Hours: Kristensen, McNish, Duval clinch Audi victory". Autosport. Archived from the original on 7 November 2018. Retrieved 7 November 2018. ^ "Allan Simonsen killed at Le Mans 24 Hours". The Sun. 5 July 2013. Archived from the original on 7 November 2018. Retrieved 7 November 2018. ^ a b Neidus, Joshua (28 June 2013). "Nissan and Mardenborough promoted to Le Mans podium". Evo. Archived from the original on 7 November 2018. Retrieved 7 November 2018. ^ Sibley, Lee (24 June 2013). "Porsche Celebrate 100th Class Victory at Le Mans After Double Win". Total 911. Archived from the original on 7 November 2018. Retrieved 7 November 2018. ^ "Mourners pack the funeral service for Allan Simonsen". Speedcafe. 3 July 2013. Archived from the original on 5 July 2013. Retrieved 7 November 2018. ^ Dagys, John (18 February 2014). "Le Mans Track Safety Improvements Revealed". SportsCar365. Archived from the original on 2 July 2014. Retrieved 12 June 2014. ^ Goodwin, Graham (20 December 2013). "Le Mans Supplementary Regulations Confirm 'Slow Zone' Safety Plan". DailySportsCar. Archived from the original on 13 April 2015. Retrieved 7 November 2018. ^ "Race – Final Classification" (PDF). Automobile Club de l'Ouest. 23 June 2013. Archived (PDF) from the original on 26 June 2013. Retrieved 23 June 2013. 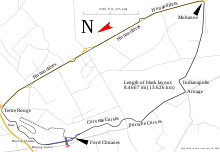 Wikimedia Commons has media related to 2013 24 Hours of Le Mans. This page was last edited on 17 April 2019, at 00:00 (UTC).